If you’re a car aficionado, then you might scoff at the tone of this piece. Of course the garage matters more than any other area of the house! It’s where you keep your most prized possessions. You probably skew more input towards the interior design of your garage than anywhere else on the property. That being said, the garage gets the back seat in most scenarios. You’ve parked your car, you’ve rolled trash bins in there, and boxes of stored goods pile higher and higher year over year. Let’s just say, it’s not integrated into the tour that you give visitors coming to call. First up, Polyurethane. They’re the industry standard and the industry standard for a reason. 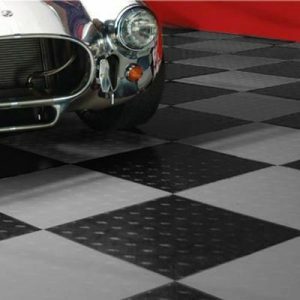 If you attend car shows regularly, you’ve probably graced a polyurethane floor with your feet. It’s durable and very resistant to chemicals that it comes into contact with. If you plan on using your garage for physical activities or high-volume foot traffic, this is a great recommendation. You won’t have to replace it, likely, in your lifetime. So what’s the drawback? For this flooring solution, it’s the price. The installation is time intensive as there are several applications involved. You can’t just pick it up at your local hardware store and do it yourself, you need to bring in the professionals for this. Polyurethane is actually an enhancement of the foundational flooring solution epoxy. Epoxy has a layer of liquid plastic underneath the actual floor. This helps it avoid any abuse from cars, feet, anything. The result is a look that’s smooth and glossy, professional to a T. It’s not super cost intensive or time intensive, definitely worth the investment. It’s only flaws are its limit of colors available—mainly grey, and that the colors may fade over time. Finally, on today’s agenda we have modular tiles. These are specifically designed to be used under cars, but look great no matter what the plan of attack for your garage. These are the lowest investment as far as effort. No glue, no chemicals- they just snap directly together! These do tend to be higher on the cost spectrum, but again, will last for a lifetime. So many options, so little time. Feel free to reach out to the Knox team with any questions.